WooCommerce shipment tracking is one of the most important aspects of any online business. It has a valuable contribution to the last moment service that your customer is going to experience. This is one of the many reasons why the WooCommerce store owners need to share the shipment tracking information with their customers. There are many shipment tracking solutions available to meet different business needs. The order tracking plugins will allow the shop owners to choose the desired shipping service and then assign the respective shipment tracking ID to their respective orders. But before using or going for any one of these plugins, you should know their end-to-end features and functionalities. You should also know how these plugins work, how will they affect your business and how deeply connected are they with WooCommerce. The understanding is necessary because if your customer walks away with a bad experience then they might end up taking their future purchase elsewhere. And this is not something that you would want from your hard-earned customers. Thus, choosing the right shipment tracking plugin for your WooCommerce store becomes quite an important affair. Keeping the above things in mind, let us go through this curated list of top five shipment tracking plugins for WooCommerce. Across the article, we have covered most of the standout and special features of these plugins. By the end of this article, you will have a clear conscience on which one of the five plugins is better for your WooCommerce store. So, without any further delay let us quickly go through the article. The Shipment Tracking Pro plugin has it all. To start with, you can add the shipment tracking information along with the order completion email. This is an automated process and the tracking information will appear on the customer’s My Account page as well as on the Admin side. The shipment tracking links are directly connected to the shipping company APIs. This link is constantly updated from the respective shipping company and it will show the real-time status of the orders. This plugin supports a large number of shipping services including 70+ pre-defined shipping services. The plugin also allows the users to add their preferred or local shipping service as well. If the users want to discontinue a particular shipping service then they can easily remove that particular service. The plugin also allows you to add your own custom text goes along with the order completion email. You can choose to import the data using the CSV including FTP upload if you have a huge list of order that needs to be updated. You don’t have to pay any monthly fee and there are no restrictions on the maximum number of shipments. 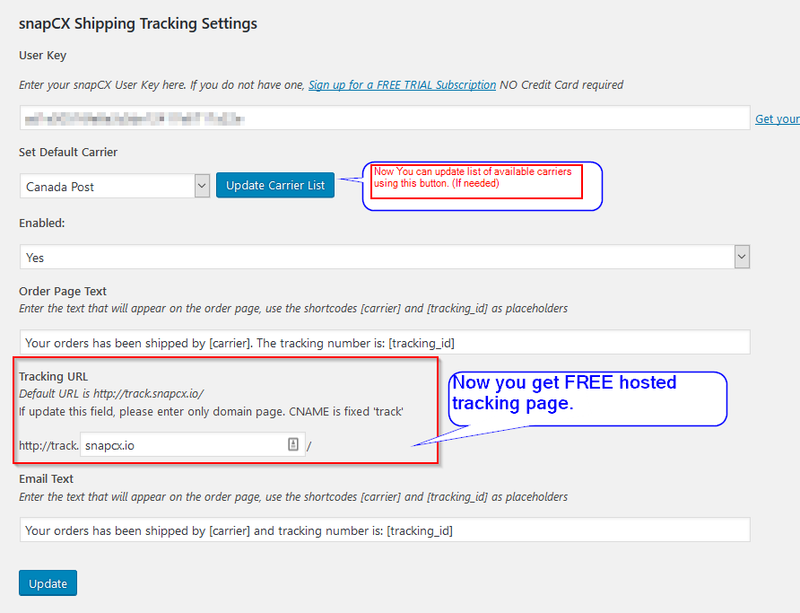 You can check out the premium version of the WooCommerce Shipment Tracking Pro plugin that has all the features. This is one of the best shipment tracking plugin that provides a completely surreal experience. This plugin offers some exclusive features that limited to the premium version only. Some of these features include things like Notifying customers of the status of the shipment. This plugin allows users to analyze the overall performance of the shipments. For example, store owners can easily check the number of failed or pending deliveries. This plugin also has a feature that allows users to modify the content of the order completion email. This feature is very crucial when it comes to providing a better customer experience. The premium version of the plugin allows users to customize the notifications according to their needs. And if you are willing to pay a little extra then you can also provide your customers with SMS notification. The Premium version of the plugin contains a huge list of features. Moreover, the pricing is monthly-based and you can check out the available plans here. This is another shipment or order tracking plugin that has a quite a lot of features. It is interesting to note that the basic version of the plugin offers quite a lot of features. But the premium version of the plugin has a quite a lot of extra features that prove to be quite useful to the WooCommerce store owners. To name a few, the plugin allows the store owners to CSV import the order tracking data associated with the means of other third-party plugins. By using this plugin store owner can show a button on the My Orders page which will take the customers to the shipment tracking page of the respective shipping company. But the plugin seems to miss out few other things like the Analytics feature in the WooCommerce AfterShip plugin. This is the official shipment tracking plugin developed by WooCommerce. It has all the basic features that are sufficient enough to provide shipping details to the customer. It has a cleaner user interface that is easier to manage. As you can see in the image below, store owners can add the shipment tracking details and assign it to the respective order. However, it misses out a lot of features that other third-party plugins offer. Another shipment tracking plugin that makes it to the list is the WooCommerce Order Shipping Tracking plugin. This plugin has two different pricing plans that provide a different set of features. It has the support of the some of the most popular shipping services like UPS, FEDEX, USPS, DHL, etc. It also has an automatic feature that can detect the shipping company just by the tracking number. As you can see in the image shown above, you just need to choose the shipping service and then add the shipment tracking link. You can even customize both the email text and the Order page text separately. This is a nice option that lets the users give a more personalized experience to the customer. You can download the plugin from here. After downloading the plugin, you would need to follow this link in order to buy the plan. You should choose the right shipment tracking plugin by analyzing your business needs and the level of customer satisfaction that you are looking for. For instance, if you are a small shop owner and you do not require features like the parcel analytics, then you can choose the WooCommerce Shipment Tracking Pro plugin. However, we would recommend you to try the demo version or the basic versions of all the plugins before going for the premium versions. This article was an attempt to help you find the best shipment tracking plugin for WooCommerce store. If you need any further clarifications or have some valuable inputs then please comment down below. If you are facing any difficulty with our shipment tracking plugin then kindly contact our customer support.